Location: Situated in village on N side of A 487. 1849 Calvinistic Methodist chapel remodelled internally 1882. Squared Pwntan sandstone with slate roof. Gable front with pediment outlined by raised strip, with projecting pieces at each end, each on two console brackets. Plain roundel in pediment. Front with two close-spaced long arched windows, two long arched gallery lights, slightly shorter, over two doors below with flat heads. Recessed cut sandstone voussoirs to all openings, windows have 1849 small-paned hornless sashes with radiating-bar heads, doors have C20 doors and overlights. 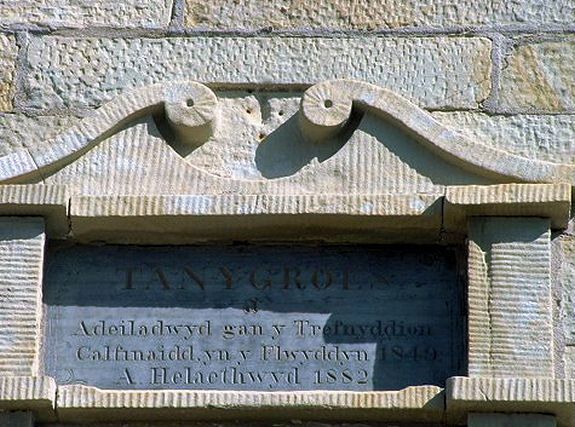 Centre plaque is rectangular, in scroll-pedimented sandstone frame, and reads "Tanygroes a Adeiladwyd gan y Trefnyddion Calfinaidd yn y flwyddyn 1849 a helaethwyd 1882". Two-storey, two-window sides with cambered-headed 12-pane sashes below and arched sashes above, cut stone voussoirs. Two-storey, two-window rear with louvred arched gable opening. Front court is enclosed to front and E by low iron railings on slate-coped low walls. Two painted Cilgerran stone piers with cross-gabled caps and double iron gates. Outer sandstone piers with similar caps. Of 1882, pulpit backing on entry wall. Three-sided gallery on fluted iron columns, curved corners, long horizontal panels with narrow strips of pierced cast-iron and pilasters with arched panels between. Fretwork cornice over columns. Three-sided pulpit with steps up and front fretwork panels. Narrow plaster arch behind pulpit. Panelled great seat. Plaster ceiling with centre rose, diagonal ribs and four corner square ventilators. Included for good front elevation in the local stone, quarried in Tanygroes. The elevation is of the early-mid C19 lateral facade type, but here combined with a gable, suggesting a transition between the side-wall and end-wall types. Just off the N side of the A487, alongside a lane leaving the main road at an angle, on the edge of a small cluster of houses, some 1km east of the main settlement of Blaenporth.